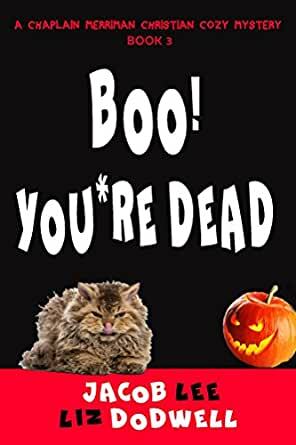 Retired army chaplain Dexter Merriman uses his wits, his wisdom and his faith – oh, and his cat Baggins - to solve a ghostly Halloween murder. A man dies and it’s ruled an accident, but Dex has a bad feeling that someone had a helping hand in the death. With the help of his sidekick, Crazy Maisy, he comes to the conclusion it was murder. The police aren’t convinced, though. So Dex dons his snooping cap to do his own sleuthing. On top of that, he’s trying to help Beans Mallozzi, an ex-con who’s just been released from jail after serving a sentence for embezzlement. But it looks as though Beans is more interested in helping himself again, and some of Dex’s friends are pretty steamed with him. As if there isn’t enough confusion, Dex is finding his feelings toward Maisy are changing, and he just doesn’t know what to do about it. Murder, ghosts, thieving ex-cons and affairs of the heart. Just how will Dex sort it all out? This was a good collaboration with a number of elements to keep the reader engaged. Admittedly, I enjoy Christian mysteries, but even those who claim not to would find nothing to complain about. Dex is a former chaplain who tries to follow where God is leading him. It in no way tries to "convert" anyone, and is no different than a main character who was a former teacher tries to continue educating those with whom they come into contact, or a scientist bringing those elements of their lives into the context of every day activities. The mystery involves an old mansion, thought to be haunted by several ghosts, that was converted into a hotel. Since it's in a small town in the Ozark Mountains, the owners use the draw of a ghost tour to bring guests to the hotel as well as an adventurous evening with dinner and the tour. On the first night, the death of a principal actor in the drama creates even more excitement and interest in the ghost tour. Dex, who was on hand with his sidekick Mazie, feels compelled to figure out how and why the death occurred. In addition, Dex is becoming more attached to Mazue, and their relationship grows. Dex also tries to lessen the friction that occurs when he seems to be interfering with the police investigation. I enjoy the interaction between the recurring characters in this series. I also appreciate that the police aren't depicted as bumbling idiots who obstruct justice through their stupidity. There is nice development of characters who work together and grow in their relationships. I recommend this as a quick read with an interestinteresting plot. It's a stand alone book, but it creates a desire to know more about the characters involved. I'm anxious to see where Dex finds himself in his next adventure. Wonderfully written Christian cozy, humorous and fun with a few important reminders about judging written into the plot. Colorful senior characters add to it's appeal. Good book. Like the content of book and it kept me engaged from beginning to end. It was packed well and received in a timely manner. Kept me guessing. Nice writing. Thanks for the opportunity to read. I like Jed all the characters and would recommend. 4.0 out of 5 starsDelightful Christian Cozy Mystery. Decided to read some Halloween based books this month. Looking for books with witches, ghosts or monsters. Saw the cover for this book and thought it would be perfect. Ends up it is a delightful Christian Cozy Mystery. Fun and light hearted. The perfect start for my holiday reading.